Native Alabamian Monroe Golden found his way to the microtonal music of Harry Partch and Ben Johnston by a convoluted path that began with 1970s progressive rock and traversed most isms associated with Western Art Music. These influences all remain, as do the heterophonic frog calls and other sounds of the Alabama night that resonate from early childhood. Here he shares twelve duets for piano and microtonal keyboard, the fruit of an introspective four-year journey. Each work is somehow connected to a place in Alabama – some with strong personal ties, others newly-discovered yet no less inspiring. If the choice of represented place is serendipitous, the microtonal structure is completely preconceived. The pieces serve as studies in the tradition of Bach’s Well-Tempered Clavier, but in overtone-based harmony rather than key relationships. The keyboard is detuned by an interval between 4 and 48 cents, in 4-cent increments, for each of the twelve pieces. Thus, the entire set explores twelve different 24-note scales made up of two asymmetrical 12-note equal-tempered scales. Available pitches at a given moment correspond to overtone relationships from fundamental frequencies that also shift in 4-cent increments. Performing are distinguished pianist Ellen Tweiten and Renaissance man Kurt Carpenter. Also on this extended CD is a bonus MP3: a spoken word version of In Pell City with performance poetry by Linda Frost. A musical journey to places in the composer's life, this release pairs Ellen Tweiten on piano and Kurt Carpenter on microtonal keyboard for a set of twelve duets. Although admitting to fleeting prog rock references in 'Montevallo', the music is firmly in the classical tradition. The beautiful thing about this disc is that the keyboard is detuned differently in each piece by an interval ranging from 4 to 48 cents...many times the two keyboards combine tunefully, while in other places they joyfully play in areas some people might call dissonant, but never falling into difficult territory. I’m used to wonderful things coming out of Minnesota label Innova from St Paul, and I almost tend to expect something out of the ordinary whenever a package from them slips through the mail slot in my Scandinavian door… and for sure, Innova outdid itself this time, with the CD Alabama Places, with compositions by Monroe Golden from the countryside of the state of Alabama. For one thing, the character of sound that come out of the mix of piano and microtonal keyboard is enough in itself to catch my attention. Secondly, the method that Golden has laid down for these works kind of wring sounds out of their midstream flow, bending, bulging and stretching, to sound a wee bit off, a little bit strange, aurally diverging, building a tickling tension, in a way that keeps the act of listening absolutely alert and focused. This music has a way of prying open hidden rooms in your listening, which you didn’t know even existed. Golden teaches you something about hearing and about sound. 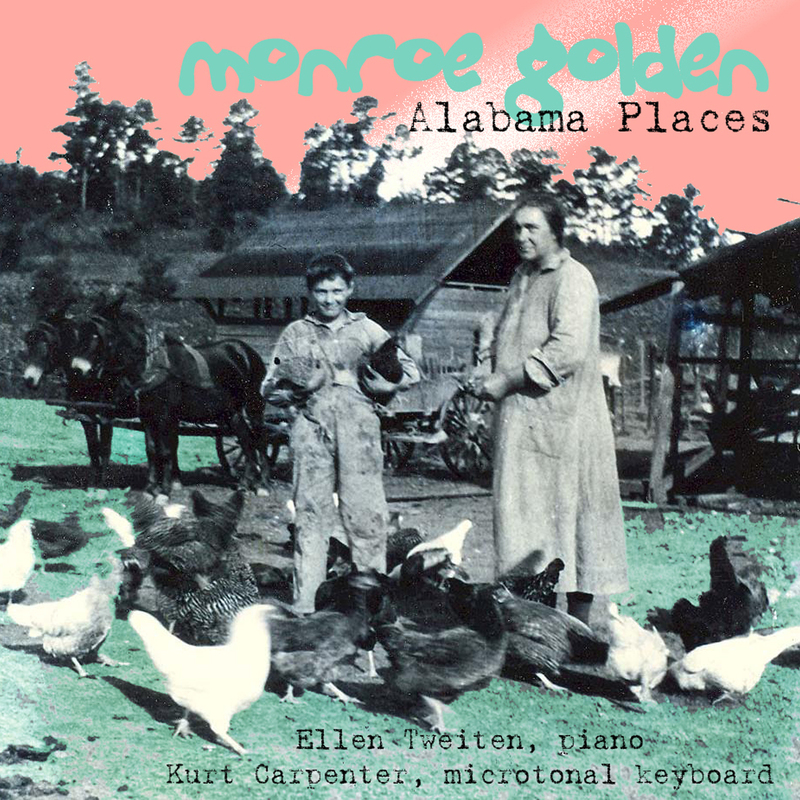 One of the most intriguing things about Birmingham composer Monroe Golden's CD, "Alabama Places," is the cover. Taken from the Golden family photographs (Golden grew up on a farm near Pell City), it shows a boy and a woman surrounded by chickens and horses with outbuildings in the background. It screams "Alabama," both as a parody and a stereotype. The music, a series of 12 duets for piano and purposely "detuned" electronic keyboard, is less Alabamian, unless listeners use a good bit of imagination when following along with the titles. Among the "places" are "Iron Road," "North Shelby," "2365 Cahaba Road," "Montevallo" and five variations of "Pell City." In all, writes Golden in the liner notes, they "explore 12 different 24-note scales made up of two asymmetrical 12-note equal-tempered scales." Got that? It doesn't matter. And it may not matter if connections are made between music and place. The music is surprisingly varied despite the minimalism and onslaught of dissonances, and brilliantly rendered by Ellen Tweiten on piano and Kurt Carpenter on microtonal keyboard. So just listen, let your mind wander, and be entertained by Golden's humor, lyricism and otherworldly tonality. In this case, that other world is Alabama. Composer Monroe Golden could be considered a minimalist in the sense that he radically limits the traditional expressive parameters of music, encouraging the listener to attend to subtle gradations in sound to find meaning and expression. Most obviously, his music has a steady pulse, using mostly the same rhythmic values -- usually regular eighth note patterns. Each piece has a limited dynamic range, with few shifts in volume to create climaxes. Repeated melodic patterns that rarely include traditional development are a basic building block of his music. Within the limitations he has set for himself, Golden has developed a unique and idiosyncratic style that in its own frame of reference is surprisingly expressive. Alabama Places is a set of 12 pieces based on the composer's reflections on various locations, some as specific as a street address of a church and some as broad as a tract of land known only as Section 16. Golden modeled the set on the concept of Bach's Well-Tempered Clavier, but his movements are based on 12 different 24-note equal tempered scales rather than on 12 key relationships. The set is scored for piano and keyboard, which is detuned by a different degree for each piece, and which can be programmed with a variety of sounds including piano, harpsichord, reed organ, and accordion. The distinctive tunings and timbral settings give each movement a distinctive character and personality, in spite of the other restraints Golden puts on his music. The places of the title are strongly differentiated, some hypnotic, some open and welcoming, and some frighteningly mysterious. Ellen Tweiten and Kurt Carpenter play with focus and attention to the score's expressive subtleties. Alabama Places makes for an intriguing and ultimately gripping experience for the listener with open ears, patience, and a taste for adventure. In Alabama Places, Monroe Golden fixates on "place" as a musical thing to explore... It's the aural equivalent of spending an hour staring at an aquarium with thick glass walls: it's quite absorbing, but requires a coordination of the senses not normally demanded, so it is a strain. If you've ever really listened deeply to a piano being tuned and enjoyed it, this may be for you. Monroe Golden has written a gorgeous tapestry of sound in his Alabama Places, at times a drop-dead beautiful microtonal virtuosity. Alabama Places, "the fruit of an introspective journey," is a set of twelve duets for piano and microtonal keyboard, conceived on the scale of Bach's Well-Tempered Clavier "but in overtone-based harmony rather than key relationships."